On Wednesday 2 April, OSA Archivum held a press conference presenting our ongoing Yellow-Star Houses program to the Hungarian media. Around 90 people attended, including journalists, representatives from our partner institutions and cultural institutions across the city, and survivors who were forced to live in yellow-star houses in 1944. A very broad range of Hungarian media outlets continue to cover the Yellow-Star Houses program, and international press attention is also growing. Two forthcoming highlights were also emphasized. By mid-April, OSA staff and volunteers will place a sticker on every single former yellow-star house, to raise awareness among the residents and encourage them to get involved. June 21, 2014 is the seventieth anniversary of the forced relocation of 220,000 Budapest Jews into almost 2,000 yellow-star house across the city. On this day, which also coincides with this year’s annual Night of the Museums festival, we are planning public commemorations in front of the remaining 1,600 yellow-star houses, involving the people of Budapest, cultural institutions, theaters, and public organizations which are today housed in former yellow-star buildings—and of course the houses themselves and their residents. This promises to be the largest community-based commemoration of Holocaust Memorial Year. For more information, please see under June 21 on our Yellow-Star Houses website. 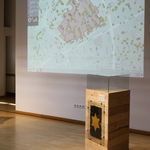 The press conference also included an introduction to the interactive map of yellow-star houses across Budapest, and the screening of an excerpt from a USC Shoah Foundation interview, and archival footage of Budapest Jews force-marched through the city in October 1944. On display were an original yellow star from a house in Budapest’s eighth district, and a yellow star worn by a resident of the yellow-star house at Rumbach Sebestyén Street 3. Sample press coverage includes an article from the Jewish Telegraph Agency, and coverage of the press conference, together with interviews, on index (in Hungarian). Yellow-Star Houses on Facebook (in Hungarian and English).